China has ordered a nationwide audit of all government debt, underlining fears that the recent slowdown in its economy may impact the financial sector. Local governments in China borrowed heavily after the global financial crisis to try to sustain growth rates. The last audit, published in 2011, showed they had debt of 10.7tn yuan ($1.7tn; £1.1tn) by the end of 2010. Debt may threaten China's growth, and there are growing fears that local governments may not be able repay. "In line with a request of the State Council, the National Audit Office (NAO) will organize auditing agencies across the country to carry out an audit of government debt," the national auditor said in a statement on its website. The NAO said that it had halted all other projects to conduct the audit, but did not give any other details or a timeline for the audit. A large part of the local government borrowings were taken up after the global financial crisis as Chinese authorities released a 4tn yuan fiscal stimulus. According to the China Banking Regulatory Commission, local governments took up 80% of total bank lending in China at the end of 2010. Some of the borrowings were spent on infrastructure projects, such as road and rail - seen as vital to sustain orderly economic development - but some of it also went into property construction. There have long been fears that the projects may not be financially viable in the long run. "A lot of the projects that were invested in will not have the kind of returns that they had initially estimated," said Dariusz Kowalczyk, senior economist with Credit Agricole-CIB in Hong Kong. "That coupled with slowing growth means that the finances of the local governments may not look too good." At the same time, there have been concerns about the size of total government debt in China, with some arguing that the figures for local government debt have been underestimated. According to the NAO's last audit, local government debt was around 25% of the China's total gross domestic product (GDP). But many have said that the levels may be much higher than that. Mr Kowalczyk said that the concerns about the bad loans in China were serious because "the size of the debt is large and unknown". However, he added that the audit was a step in the right direction and would be good for the country in the long run as it should help bring out the details on the the size of the problem. There are also concerns over the way the local government debt has been managed. 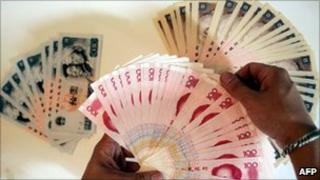 Last year, the audit office said that it had uncovered 531bn yuan of irregularities in local government debts. It said that breaches included "irregular credit guarantees", "irregular collateral" and "fraudulent and underpayment of registered capital". The Chinese central government has repeatedly stressed the urgent need to guard against financial risks, including the local government debt problem. In June, Liu Jiayi, auditor general with the NAO, warned at a session of China's top legislature that local governments must improve their debt management in order to handle escalating growth in local debt.